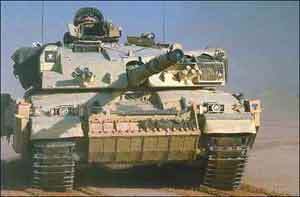 Challenger 2 is an advanced main battle tank built by the UK company, Vickers Defence Systems Ltd. 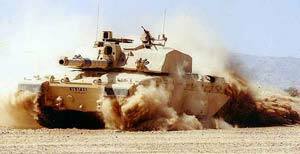 Challenger 2 is in service with the British Army and with the Royal Army of Oman. 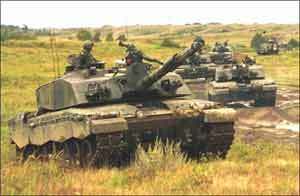 The UK placed orders for 127 Challenger 2 tanks in 1991 and an additional 259 in 1994. 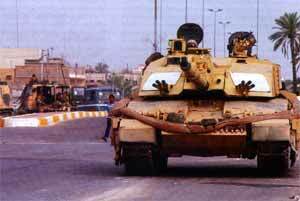 In 1993 Oman ordered 18 Challenger 2 tanks and an order for a further 20 tanks was placed in November 1997. 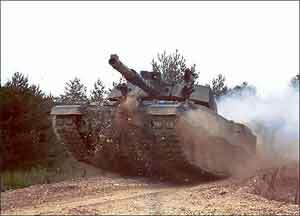 Challenger 2 entered service with the UK Army in June 1998, and it is expected that all regiments will be equipped with Challenger 2 by 2002. Deliveries for Oman should be completed by 2001. 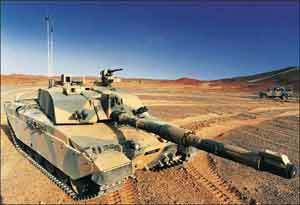 Challenger 2E, the latest development model, has been designed for the export market and is suitable for harsh environmental and climactic conditions. 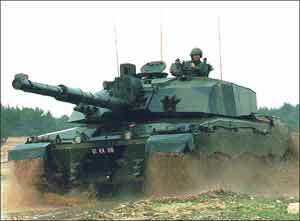 Challenger 2 is equipped with an L30, 120 mm rifled tank gun from the Royal Ordnance division of BAE SYSTEMS. The gun is made from electro-slag refined steel (ESR) and is insulated with a thermal sleeve. It is fitted with a muzzle reference system and fume extraction. The turret is capable of 360 degree rotation and the weapon elevation range is from -10 to +20 degrees. There is capacity for 50 120 mm projectiles, including armour piercing fin-stabilised discarding sabot (APFSDS), high explosive squash head (HESH) or smoke rounds. The L30 gun can also fire the Depleted Uranium (DU) round with a stick charge propellant. With the DU round, the L30 is part of the Charm 1 gun, charge and projectile system. A Charm 3 system is under development in which the DU projectile has a higher length to diameter aspect ratio for increased penetration. The gun control is provided by an all-electric gun control and stabilisation system from BAE SYSTEMS. 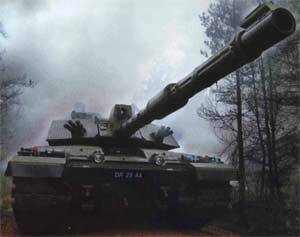 Challenger 2 is also equipped with a Boeing 7.62 mm chain gun, which is located to the left of the main tank gun. The loader has a 7.62 mm GPMG L37A2 anti-air machine gun, mounted on the cupola. 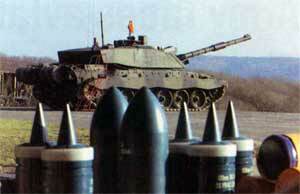 The turret is protected with second generation Chobham armour. A nuclear, biological and chemical (NBC) protection system is located in the turret bustle. On each side of the turret are five L8 smoke grenade dischargers, from Helio Mirror Company. 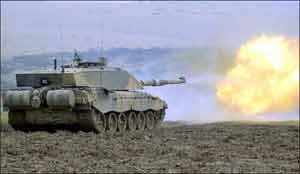 Challenger 2 can also set a smoke screen by the injection of diesel fuel into the engine exhausts. The digital fire control computer from Computing Devices Company has capacity for additional systems, for example a Battlefield Information Control System. The commander has a panoramic VS 580-10 gyrostabilised sight from SFIM Industries. A laser rangefinder is incorporated into an intermediate assembly. Elevation range is +35 to -35 degrees. The commander's station is equipped with eight periscopes which provide 360 degree vision. The Thermal Observation and Gunnery Sight II (TOGS II), from Pilkington Optronics, provides night vision. The sensor is based on UK TICM 2 common modules. The thermal image, with magnification x 4 and x 11.5 is displayed in the gunner's and commander's sights and monitors. The gunner has a Pilkington Optronics stabilised Gunner's Primary Sight, consisting of visual channel, 4 Hz laser rangefinder and display. The laser rangefinder has a range of 200 m to 10 km. The driver is equipped with an image-intensifying Passive Driving Periscope (PDP) from Pilkington Optronics, for night driving. 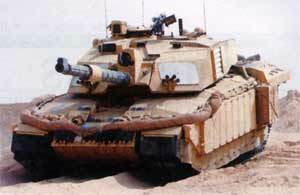 The Challenger 2 has a 12 cylinder 1200 hp Perkins diesel engine and a David Brown TN54 gearbox, with 6 forward and 2 reverse gears. Second-generation Hydrogas suspension and hydraulic track tensioner are fitted. The maximum speed by road is 59 km/hour and 40 km/hour cross country. The range is given as 450 km by road and 250 km cross country. Challenger 2E has a new integrated weapon control and battlefield management system, which includes a gyrostabilised day/thermal sight for both commander and gunner. This allows hunter/killer operations with a common engagement sequence. An optional servo-controlled overhead weapons platform can be slaved to the commander's sight to allow operation independent from the turret. The powerpack has been replaced with a new 1500 hp Europack with transversely mounted MTU 883 diesel engine coupled to Renk HSWL 295TM automatic transmission.